Nyob zoo, Pismo Beach! Kuv lub npe hu ua Shredder. I’m taking a poll to determine the extent of support for this column in Pismo Beach. If it’s high enough, I’m going to propose that you all give me money. Really though, I’m going to propose that you give me money no matter what happens with this poll. The poll is just a slick PR move so I can pretend to care what you—let’s call you the little people, shall we?—all think, to grease you up in anticipation of the fact that I’m going to ask you for money. For the sake of keeping things interesting, I paid $17,700 to a couple guys I met at a bar to call and scream at you in a foreign language. The reasoning here is two-fold: Firstly and always most importantly, it entertains me to hear geriatrics yell, “Damn it! I did not sit hear watching Wheel of Fortune for 40 years so you could speak whatever the hell you’re speaking on AMERICAN soil! Speak English!” and then hang up the phone and promptly forget the conversation ever happened. Secondly, I’m hoping a little confusion will give me more freedom when it comes time to interpret the results of my little poll. “Hello? Yes? 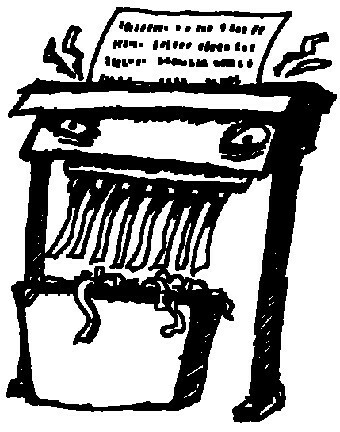 What?” could just as easily mean, “Hello, Shredder; yes, I’d love to give you some of my money; and what would be better?” Maybe the city of Pismo Beach had the same idea in mind when Probolsky Research, which received $17,700 to conduct the “poll” to “figure out how voters felt about renewing Measure C,” used Hmong speakers to call residents. I’d pay a pretty penny to listen to a recording of those conversations—the confusion; the anger; the ugly surges of xenophobia when people realized someone was trying to talk to them IN ANOTHER LANGUAGE. For crying out loud, we speak one language here, and we speak it poorly, or else! So how did this happen? The smart money says the company, which is based in Newport Beach, somehow decided that Pismo Beach was a Hmong community. As to how that might have occurred, I’m developing a theory that CEO Adam Probolsky watched Gran Torino while falling asleep the night before the survey began and went to work the next day more than a little confused. This is all theoretical of course, because Probolsky insisted that all questions about his company’s error should be directed to City Manager Jim Lewis. Which is probably for the best, considering that the same month his company made the error, he Tweeted, “Sometimes reporters ask the wrong questions and I am glad, because I’d prefer not to answer the ones they should have asked.” Trumpeting a challenge to journalists when you’re not even capable of offering an explanation for a ridiculous and most likely expensive error probably means someone should block his access to Twitter before he gets himself in even more trouble. But there are worse things than paying a marketing research company to call your residents before you try to shake them down for more sweet, sweet Measure C funding in a language none of them speak. You could live in a town represented by a city councilman whose favorite and only political tactic is to shove his thumbs in his ears, scream “lalalalala!” and refuse to meet with people he’s publicly insulted. This was the case when Justin Wellner, director of government and community relations at Cal Poly, sent Dan Carpenter a polite email offering to meet with him to discuss his concerns about a new proposed student housing project. Wellner apparently read Carpenter’s critique of the project in New Times and wanted to discuss what the university was doing to address Carpenter’s public complaints. The city councilman’s response was so petulant that I’ve been half expecting a stack of 3-year-olds—collectively referred to as a “smudgy”—to shake off the city councilman costume they’ve been wearing and emerge as the puppet masters behind Carpenter’s antics. I’m not what you’d call an expert on positive or productive relationships—my longest term liaison was with a scarecrow named Misty that I had to throw away once it started to decay—but even I know that insulting someone in public + refusing to meet with them to discuss it + insulting them in an email does not = a positive relationship even if you claim that’s your ultimate goal. Carpenter fancies himself a man of the people, but when the people in question bought a house adjacent to a university and then complained because it was noisy and the neighborhood was full of students, the people in question might make better use of a group lobotomy than a caped crusader. We like to think of ourselves as the hot young trophy wife oppressed by the attentions of Cal Poly, which is a liver-spotted old fart who spits when he talks, but hey, he’s loaded so we pretend to tolerate him while complaining about the spit stains on the fancy dress he bought us just last week. Which is a roundabout way of saying: You can’t get the students’ money without the students, and criticizing their behavior while flipping the bird at Cal Poly instead of working with them is no better than painting yourself green and dancing on a rooftop on St. Patrick’s Day. At least the wannabe Hulk is just making himself look bad, while Dan Carpenter is making the rest of us look bad. Shredder only uses blue body paint while pretending to be Na’vi. 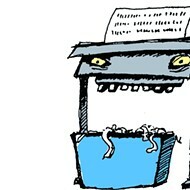 Send handmade bows and arrows to shredder@newtimesslo.com.